This nimble little French rotary-engined biplane fighter with its distinctive sesquiplane (1 ½ wing) ‘Vee’-strut design entered service in early 1916. Fitted with an over-wing Lewis machine gun, allowing the bullets to clear the airscrew arc, it was faster and more manoeuvrable than the Fokker Eindeckers. 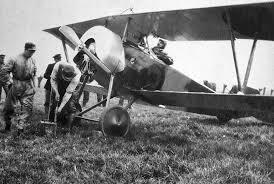 Flown in French and Belgian escadrilles, the Nieuport 11 also served with distinction in the RFC and RNAS. This little fighter, and its derivative the Type 16, was also flown by American volunteer pilots of N.124 (the Lafayette Escadrille) to great effect. In the bloody slaughter of Verdun, French Nieuport flyers would gain everlasting fame: one of them, Jean Navarre, became known as la sentinelle de Verdun.